One of the biggest complaints with small tanks is their lack of room. By the time you set up your decorations, such as gravel, plants and rocks, there isn’t a lot of room for much else – especially not a heater. And before you ask, no, you cannot skip buying a heater. You see, rapidly rising and falling temperatures cause your fish stress, which can soon lead to death. And, temperatures change much more quickly in a small tank than in a large one. Besides, tropical fish like betta need warm water to survive. 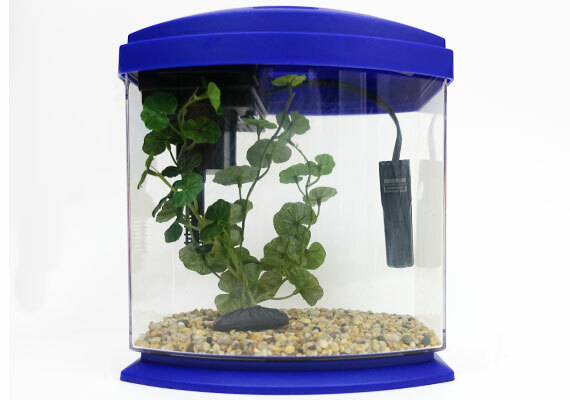 It is for this reason that a heater is essential to your tiny tank, no matter how cramped it may be. 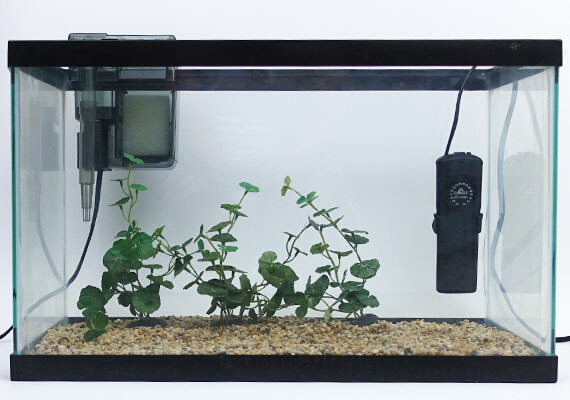 Which heater is best for your tiny tank? More often than not, the problem is that they are using the wrong-sized heater for their tank. The temperature you want to raise your aquarium water to. The power of an aquarium heater is measured in watts (W). The more watts, the more powerful the heater. 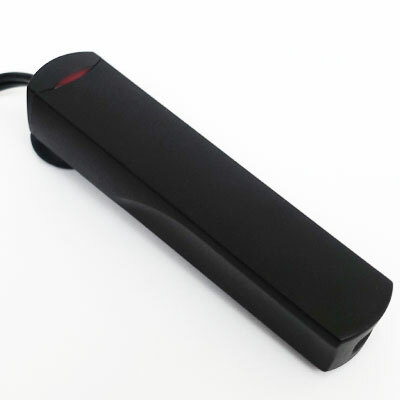 A 20-watt heater, for example, is twice as powerful as a 10-watt one. The bigger your aquarium, the more watts you need to heat it. The following table shows the heater wattage you need in order to heat a tank up to 10˚F higher than your room temperature. If your heater cannot warm your tank within 7 hours, it’s probably too small. Ordinarily, preset heaters have been manufactured to reach a specific temperature – typically 78˚F (26˚C). Once this temperature is reached, the heater automatically shuts off and won’t turn on again until the temperature drops. However, the majority of the preset heaters designed specifically for small tanks operate a little differently – they are “always on” and never shut off. Do you have fish that prefer cooler or warmer water? Tough luck! You cannot change it – you are at the mercy of your heater. You don’t have to go far to find horror stories of preset heaters killing fish. Always-on heaters don’t regulate the temperature. If the temperature of your room increases, say on a hot summer day, then using these heaters will also increase the temperature of your tank – which may be too hot for your fish. 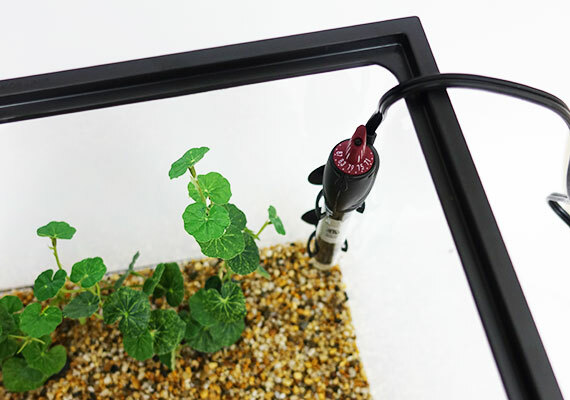 However, you can get around this with the use of an aquarium temperature controller. This nifty device shuts your heater off if your water becomes too hot and turns it back on once the water cools – keeping your fish safe. The number one advantage of preset heaters is their size. 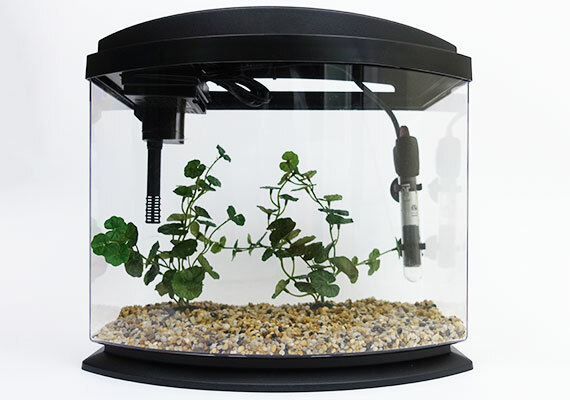 Without the need for a thermostat, manufacturers have been able to create some impossibly slim and small aquarium heaters. I generally don’t recommend “always-on” preset heaters. 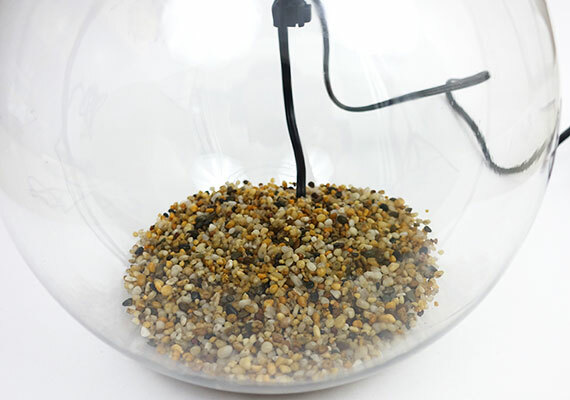 But if you have a small fishbowl with less than 3 gallons of water, a compact preset heater will leave you with more space for your critters or decorations. 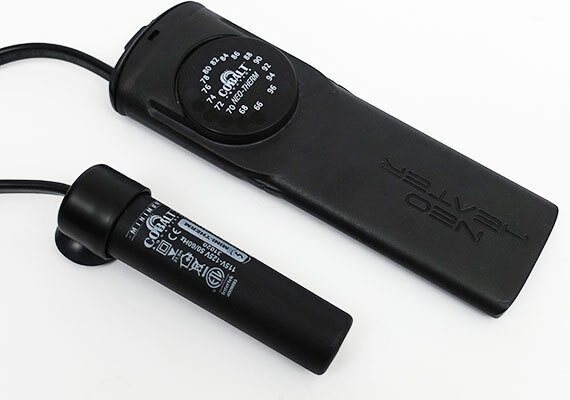 These aquarium heaters allow you to select a temperature within a defined range, generally between 66-96˚F (19-36˚C). Once this temperature is reached, the heater shuts off and won’t start again until the temperature drops below this setting. While adjustable heaters are often larger than preset heaters, they have the advantage of allowing you to regulate the water temperature according to the fish you keep. Use the thermostat to make the water hotter in winter and cooler in summer – so your fish don’t cook or freeze. At 4 5/8 x 3/4 x 1 inches (not including the suction cup), this is the smallest preset heater that also includes a temperature control. 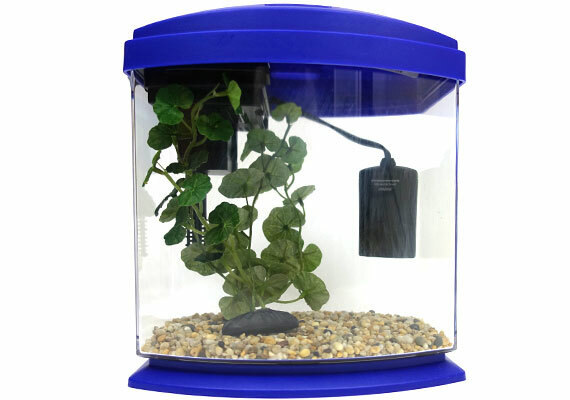 The Marina Compact is factory set at 78˚F (26˚C), the ideal temperature for most tropical tanks. Once the temperature exceeds this, the heater shuts itself off until the water drops below 78˚F. The heater then turns on again, and the cycle repeats. I used an accurate aquarium thermometer to test and can confirm the heater worked as advertised. 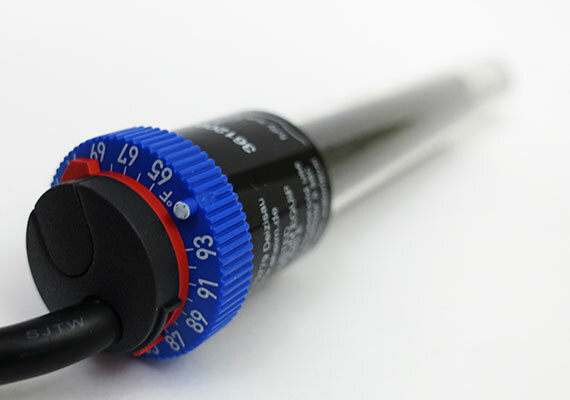 Speaking of which, if you need a good aquarium thermometer, FishLab reviewed those here. You know what the heater is doing by the indicator light on the front of the unit. It turns on while heating and turns off when waiting for the temperature to drop. 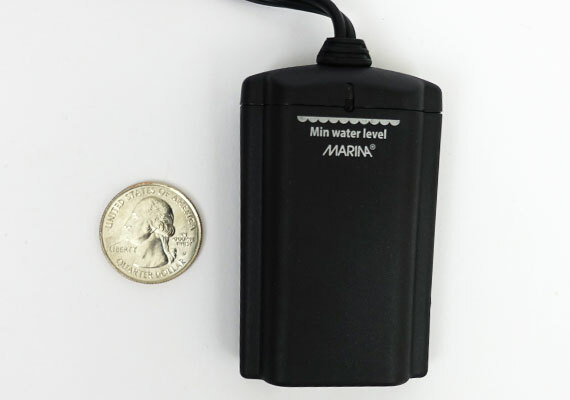 As expected, the Marina compact is fully submersible. You can and should completely cover it with water! If you need a mini heater, start with this one. 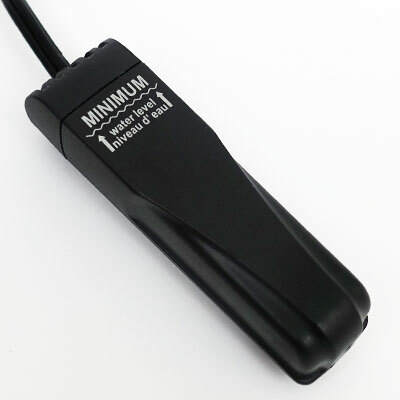 The Marina Compact may be slightly larger than other preset heaters, but its ability to maintain a constant temperature is worth the extra length. To say that this is a mini tank is an understatement. But as you see, this compact heater barely takes up any space at all. It’s also suitable for fishbowls. 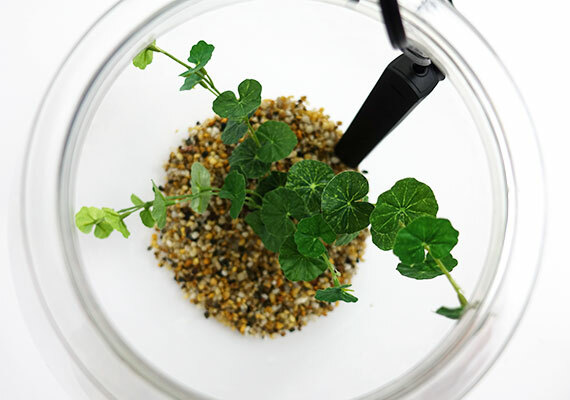 We tested it in a 2-gallon bowl and were satisfied with how little space it took up. Because the suction cup is located at the top of the heater, it can easily cling to the curved surface of a fishbowl. Have a tiny tank and want a small heater to match? This one is as good as it gets. 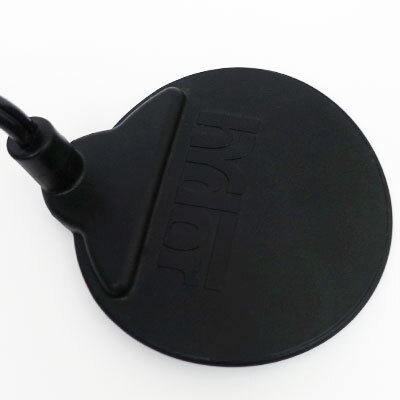 The Hydor Theo is an adjustable aquarium heater. Most importantly, it’s the smallest adjustable heater on the market. Want your water hotter or colder to suit your specific fish? Or, maybe you want to turn the heater down during summer. Simply twist the dial on the top of the heater to select a temperature between 67-91˚F (19-33˚C). Best of all, when tested against our calibrated testing equipment, we found that the heater was within 1˚F of the selected setting. As you expect, the heater shuts down when the water exceeds the set temperature and switches back on when the temperature drops. An indicator light on the side of the heater lets you know what it’s doing. 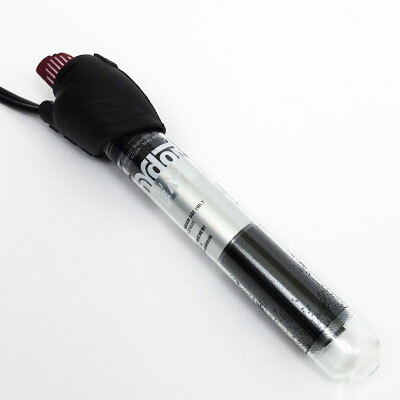 Both the 25W and 50W models are 7-inches (18-cm) long, making them perfect for heating smaller tanks, up to 5 gallons. Or, depending on what you have in your tank, you can mount the heater horizontally. Good news! Once you reach this size, you can use almost any heater you want. 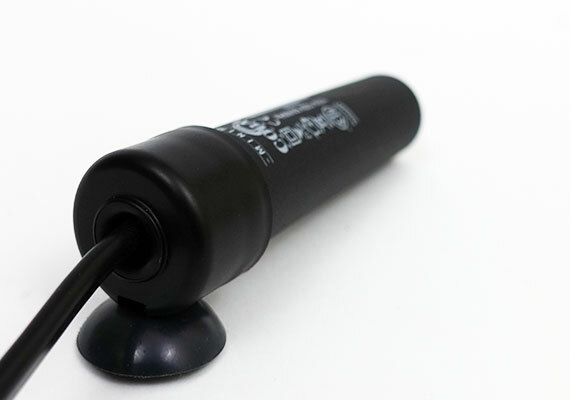 Out of all the aquarium heaters we reviewed, the Cobalt Neotherm was the clear winner. 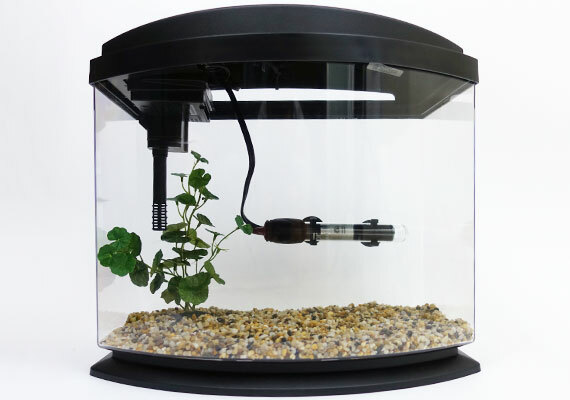 We don’t just recommend it as the best aquarium heater for small tanks, FishLab recommends it as the best aquarium heater for all tanks! Accurate to ± 0.5°F, you can be confident that whatever temperature you set is what it will heat to. No other heater we tested offered this degree of precision. The Cobalt Neotherm is the heater I currently use on most of my tanks. At the time of writing this, the oldest one has been going strong for over 6 years. Note: The 50W and 75W Cobalt Neotherm models are generally the cheapest. Want more info? 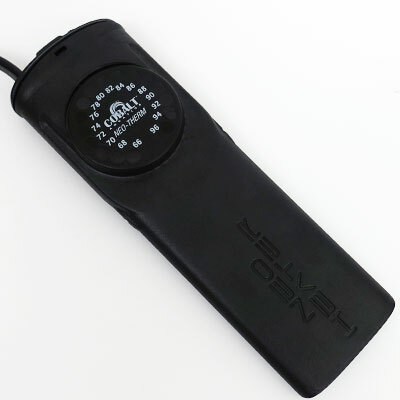 Check out our detailed Cobalt Neotherm Review. I would recommend the Aqueon Pro as the runner-up, but they are currently in the middle of updating their heaters. The current models are pretty great. 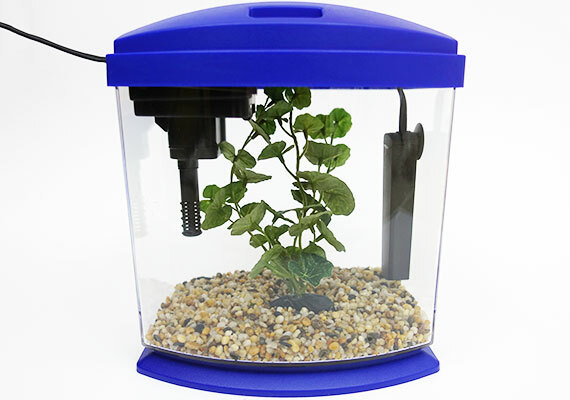 Unfortunately, given Aqueon’s track record with other aquarium products we have tested, such as their air pump, gravel vacuum and water changer, there is no guarantee the replacements will be as good. I will comment once the new models are released, and we have tested them. 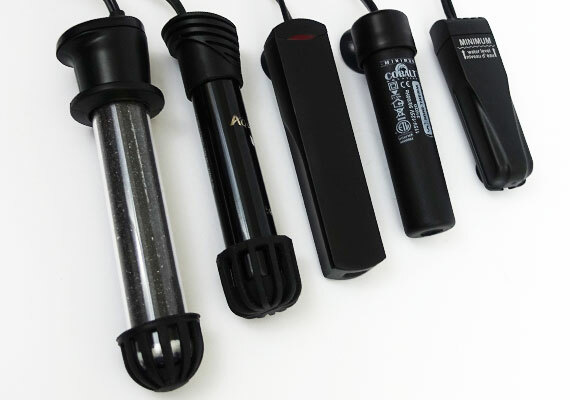 This section covers the smallest of the small aquarium heaters. To reduce the size, these heaters are stripped of virtually every feature. Yep, they are little more than a heating element and a cover. These heaters are “always-on,” and the only safeguard is you choosing the correct size for your tank. Let me make it clear that the heaters I listed earlier in the guide are superior in every way. Due to the lack of safety features found on the following heaters, I don’t recommend them. The only reason you would choose these heaters is if you value size above everything else. And if that’s the case, you’ll be impressed by just how small these itty-bitty heaters are. You won’t find anything smaller than these tiny heaters. This circular heater is designed to sit in the flat section at the bottom of your fishbowl. 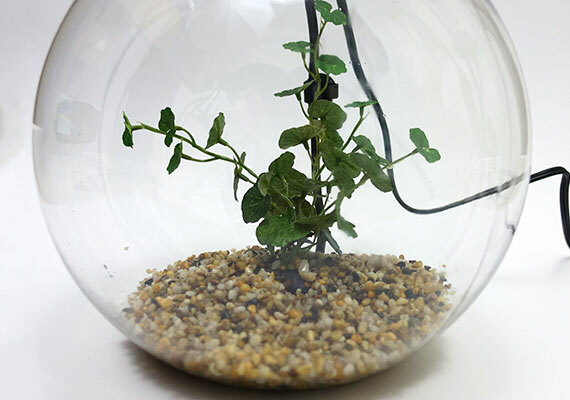 Add a fake plant on top to hide the power cord, and you are done. No other fishbowl heater can be so easily hidden. If you made it this far, then you should have found the perfect small heater for your aquarium. The best small heaters for tiny aquariums. 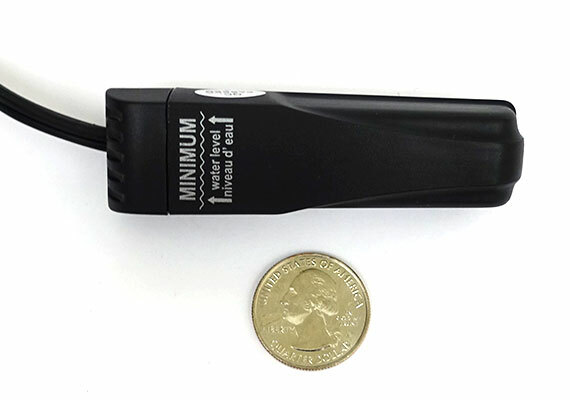 While a tiny aquarium heater is tempting, the smallest lack essential features found in my slightly larger recommendations – these hit the sweet spot between size and safety. Which heater do you use to warm the water in your small tank? Let me know in the comments below! Do you have any reviews for heaters for larger tanks, say 75 gallon to 125 gallons? I have read so many reviews that are good and bad with the different brands, it hard to know which to pick. For larger tanks, I recommend the Cobalt Neotherm (or two, depending on how large your tank is). The Fluval E, despite having an innacurate temperature display is probably the next best pick, but I have had trouble locating it in recent months. 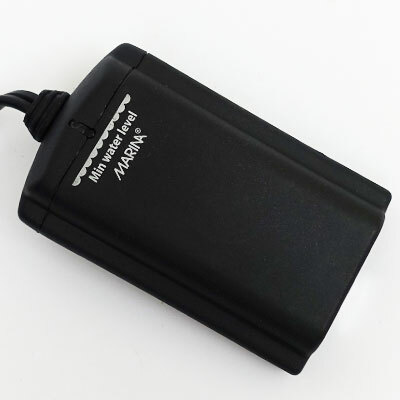 The Aqueon Pro USED to be great, when it was made in Italy, it’s now made in China and is a shadow of it’s former self. Please note that ALL heaters have a chance of failure, even one that could be called “the best” Anyone who tells you that there is a 100% safe aquarium heater is lying. Unfortunately, it’s the state of the hobby at the moment. I bought the Hydor Theo 25w for my Fluval Spec III (2.6 gallons). But, the temp drops at night are significant enough that the Hydor can’t keep the temp at the set 75 and the water dips to 73.4-ish. In a couple of months, it will be summer and this won’t be an issue, but in a couple of months, maybe I don’t have a fish anymore with nightly temp drops. I don’t have a better place to move the tank that will solve the problem. Would upping to a 50w work? Two small heaters on opposite sides of the tank (I happen to have a 10w not in use) at night until the weather warms? Suggestions? I thought getting my kid a betta would be an easy first fish, but things have changed since I was a kid with a fish in a bowl. You must live where it’s quite cold. To answer your question, both would work. Either upping to a 50w or adding another 25W heater has the exact same effect. Your 10W may be just enough to keep the temperature up. Alternatively, will turning your Hydor higher temperature at night then down again also work? I have every one of your top picks already . Great minds think alike , lol. I am looking for a new heater for my 80 gallon tank . I see you recommend the 306 controller . Do you have a pick for the heater ? That is funny! I’m glad to hear you have had the same positive experience! Honestly, for the heater, it’s either the appropriate sized Cobalt Neotherm, I linked the review in this guide, or the eheim Jager, reviewed here. Some people have a preference for glass heaters and that is still the undisputed king after all these years. I personally dislike it for it’s size, but that’s doesn’t seem to turn many people off. Three of my four tanks currently rock Cobalt Neotherms, the fourth a Eheim jager but this is more because I was impatient and my local fish store was sold out of Neotherms at the time. If you have a good experience with the Cobalt Neotherm and don’t dislike it (the mounting bracket isn’t the best) then I see little reason to try something else. Unfortunately, all heaters have a chance of failing, even my recommendations. I’d love for someone to make a 100% reliable heater, but let’s face it – it ain’t gonna happen.